Papis scored the 4th last-place finish of his NASCAR Sprint Cup career in Sunday’s Lenox Industrial Tools 301 at New Hampshire Motor Speedway when his #13 GEICO Toyota fell out with brake problems after completing 11 of the race’s 301 laps. Papis qualified 32nd for Sunday’s race, his first at New Hampshire, at a speed of 130.024 mph, besting seven other drivers who were not locked-into the field on speed. Defending LASTCAR Cup champion Dave Blaney, with whom Papis is now tied for 2nd in the current 2010 rankings, fell out nine laps later with power steering issues. Blaney has yet to finish last since the Coca-Cola 600, four races ago. Current LASTCAR leader Joe Nemechek qualified a stunning 7th on Friday, but when a sponsor still didn’t show up, he too was forced to go behind the wall after 68 laps. *This was Papis’ third consecutive last-place finish, making him just the second driver in Cup Series history ever to do so. Dave Blaney scored three straight last fall at Bristol, Atlanta, and Richmond. *A Cup driver had not finished last at New Hampshire with brake problems since Carl Long’s #00 Buyer’s Choice Auto Warranties Chevrolet fell out 8 laps into the 2005 New England 300. *The #13 had never before finished last in a Cup race at New Hampshire. *This was the third consecutive year that a Toyota has finished last in this event. Dennis Setzer picked up the 9th last-place finish of his NASCAR Nationwide Series career in Saturday's New England 200 at the New Hampshire Motor Speedway when his unsponsored #92 K-Automotive Motorsports Dodge fell out with an ignition problem after completing 2 of the race’s 200 laps. It was Setzer’s 7th last-place finish in 2010 alone. One week after Andy Ponstein drove the #92 to a 42nd-place finish at Road America, Setzer returned and qualified 35th at a speed of 124.357 mph, beating five other cars that were not locked into the field on points. With 16 races remaining, Setzer is already just five last-place finishes away from breaking Jeff Fuller’s single-season record of 11, set in 2004. 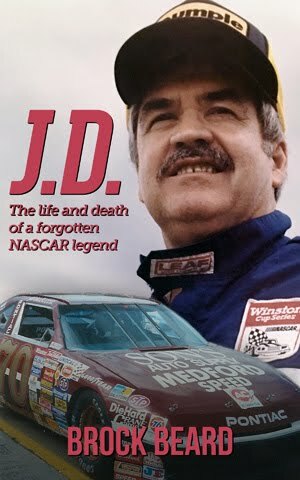 When combined with Johnny Chapman’s additional last-place finish in the #92 at Bristol, the team is also six finishes away from breaking the single-season team record of 13. 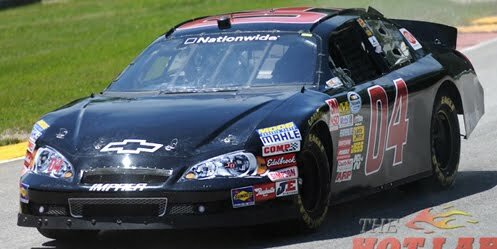 Chapman, still tied for 3rd in the Nationwide Series LASTCAR rankings, made just his fourth start of the 2010 season, but his first drive for owner Dana Tomes ended after 5 laps, leaving him 40th. Team owner Brian Keselowski qualified his #26 next to him in 36th and fell out of the race seven laps later with brake problems, winding up 39th. *Neither Setzer, nor K-Automotive Motorsports, nor the #92 had ever finished last in a Nationwide Series race at New Hampshire. Max Papis scored the 3rd last-place finish of his NASCAR Sprint Cup Series career in Sunday’s Toyota / Save Mart 350 at the Infineon Raceway when his #13 GEICO Toyota was involved in a grinding four-car accident ended his day 65 laps into the 110-lap race. Papis came into the weekend as driver of the fastest car outside the Top 35 (12th overall) in Friday’s practice session. However, the track was much slicker in qualifying, dropping him to the 29th starting spot. Still, only three “go-or-go-homers” outpaced him that afternoon: Boris Said (17th), David Gilliland (26th), and Joe Nemechek (28th). In the early stages of the race, Kyle Busch was the first car to go behind the wall following his lap 10 accident in the Esses, followed on lap 16 by P.J. Jones, in a 2nd Robby Gordon-owned car. First Busch, then Jones returned to the track more than 10 laps down, leaving last place up for grabs. Jones ended up the lower-finishing of the two when electrical problems left him with a 41st-place finish, but Jones was unable to score his second consecutive last-place finish at Sonoma. Last-place leaders Joe Nemechek and Dave Blaney were both able to complete more than half the race before mechanical problems took them out. Nemechek secured sponsorship from former team owner Rick Hendrick, whose HendrickCars.com graphics were put on the owner-driver’s Toyota. Dave Blaney’s unsponsored PRISM Motorsports ride was apparently able to use the technical support of part-time teammate Michael Waltrip after Waltrip’s “Sponsafied” #55 failed to qualify on Friday. It was the first time Blaney was able to complete the majority of a Cup race since Las Vegas. All the while, Papis fought to work his way up the pack and avoided involvement in all the early-race incidents. Although Papis struggled in the early stages, running 35th on lap 47 after saving his car from a spin with Tony Stewart, the Germain Racing team was keeping up with the adjustments and the Italian driver was soon able to keep the same pace as the dominant car of Jimmie Johnson. Unfortunately, Papis’ come-from-behind performance was cut short when a sluggish lap 66 restart by the leaders sparked a four-car chain-reaction accident behind them at Sonoma’s notoriously-narrow frontstretch. Papis and Martin Truex, Jr., unable to avoid the wreck, received the worst damage and neither were able to return to the track. The race marked Papis’ second consecutive last-place finish and second-ever on a road course. He was involved in an equally-vicious accident with just 9 laps to go in the 2008 Centurion Boats at the Glen. *This was the second time the #13 had ever finished last in a Cup race at Infineon. Jerry Nadeau’s FirstPlus Financial Ford started on the outside pole in the 1998 Save Mart / Kragen 350, but after running off-course in the second corner, Nadeau was taken out in a single-car accident in the Esses after 13 laps. Kevin Lepage scored the 9th last-place finish of his NASCAR Nationwide Series career in Saturday’s inaugural Bucyrus 200 presented by Menards at Road America when his unsponsored #04 JDavisMotorsports.com Chevrolet fell out with rear end problems after 1 of the race’s 50 laps. Lepage qualified in the 43rd and final starting spot at a speed of 94.055 mph, but fell out of the race after completing just one lap. Both Andy Ponstein, driving the series leading #92 K-Automotive Motorsports Dodge and Josh Wise in Specialty Racing’s #61 qualified ahead of Lepage and followed the #04 into the garage on the same lap. This snared Lepage the 43rd and final finishing position by virtue of his qualifying run and ended the #92 team’s two-race streak. *Lepage had not finished last in the series since the 2009 Virginia 529 College Savings 250 at Richmond, where his Derrike Cope-owned #78 was involved in a three-car crash on the first lap. *Johnny Davis’ #04 team had not finished last in the Nationwide Series since Mark Green fell out with a vibration 2 laps into the 2009 Aaron’s 312 at Talladega. Max Papis picked up the 2nd last-place finish of his NASCAR Sprint Cup career in Sunday’s Heluva Good! Sour Cream Dips 400 at Michigan International Speedway when his #13 GEICO Toyota fell out with overheating problems after completing 8 of the race’s 200 laps. Papis qualified 38th for Sunday’s race at a speed of 185.821 mph, beating five other cars who were not locked into the field. As this was one of the handful of races Papis was running without full funding, the #13 pulled behind the wall during the opening green-flag run, besting 42nd-place Todd Bodine by 12 laps. Bodine, still 6th in the LASTCAR Sprint Cup standings, has yet to score a last-place finish in 2010. *Papis’ only other last-place finish in the Sprint Cup Series came in his 2nd series start, when his #70 HAAS Automation Chevrolet was involved in the massive multi-car crash that marred the finish of the 2008 Centurion Boats at the Glen. 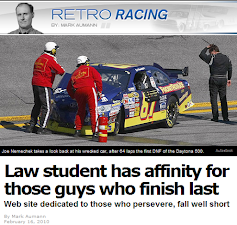 *It was the first last-place finish for Germain Racing in the Cup Series. *The #13 had not finished last in a Cup race since Greg Sacks’ unsponsored Dodge fell out with brake problems 5 laps into the 2005 Pennsylvania 500 at Pocono. *The #13 had never before finished last in a Cup race at Michigan. *A driver had not finished last at Michigan due to overheating problems since all-time NASCAR last-place leader Derrike Cope’s #74 Howes Lubricator / Royal Admin. Dodge fell out 12 laps into the 2006 3M Performance 400. Dennis Setzer picked up the 8th last-place finish of his NASCAR Nationwide Series career in Saturday’s Meijer 300 at Kentucky Speedway when his unsponsored #92 K-Automotive Dodge fell out with electrical problems 6 laps into the 200-lap race. Setzer qualified 30th at a speed of 171.991 mph. It was not only his second consecutive last-place finish in the Nationwide Series, but his second straight starting from that spot. 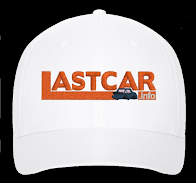 He continues to hold a commanding lead in the LASTCAR standings and has moved to 7th in the LASTCAR Nationwide Series rankings. Matt Carter finished 42nd on Saturday for the second consecutive race; he has yet to score a single last-place finish in his young Nationwide Series career. *Neither Setzer, the #92, nor Brian Keselowski’s team had ever before finished last at the Kentucky Speedway. J.C. Stout picked up the 1st last-place finish of his NASCAR Camping World Truck Series career in Saturday’s VFW 200 at the Michigan International Speedway when his #16 Fuel Doctor Chevrolet fell out with ignition problems 6 laps into the 100-lap race. Stout qualified 31st for the race at a speed of 166.509 mph, second slowest among those not locked-into the field based on Owner Points. The finish came in Stout’s 28th series start. The 25-year-old driver has no other last-place finishes in NASCAR’s top three series, which currently encompasses eight additional Nationwide Series starts from 2008-2009. Last-place leader Mike Garvey finished 31st, having fallen out 24 laps into the race with handling problems. 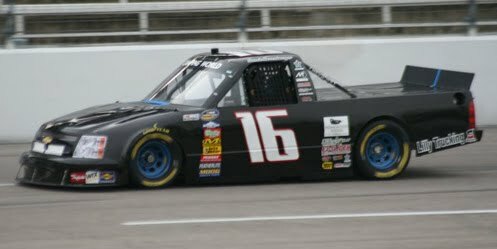 *The race marked just the fourth time that the #16 had ever finished last in a Truck Series race (twice with Jack Sprague, once with Mike Bliss). The number had never before finished last at Michigan. *Stout is the first Truck Series driver to finish last with ignition problems since Butch Miller fell out three laps into the 2008 Camping World 200 at Gateway. Joe Nemechek scored the 21st last-place finish of his NASCAR Sprint Cup career in Sunday’s Gillette Fusion ProGlide 500 at the Pocono Raceway when his unsponsored #87 NEMCO Motorsports Toyota fell out with transmission problems after completing 11 of the race’s 204 laps. Nemechek qualified 30th, but was off the pace as the field neared the lap 15 competition caution. 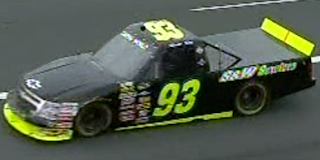 Four laps before that caution fell, Nemechek went behind the wall under green. Chad McCumbee, making his first start since the 2008 Ford 400 at Homestead, missed his first career last-place finish when he parked Larry Gunselman’s #64 following the lap 20 restart. Geoffrey Bodine followed suit the next lap, ending his first Cup race in nearly six years. Bodine has 11 last-place finishes in the Cup Series, most recently in the 2002 New England 300 at New Hampshire. 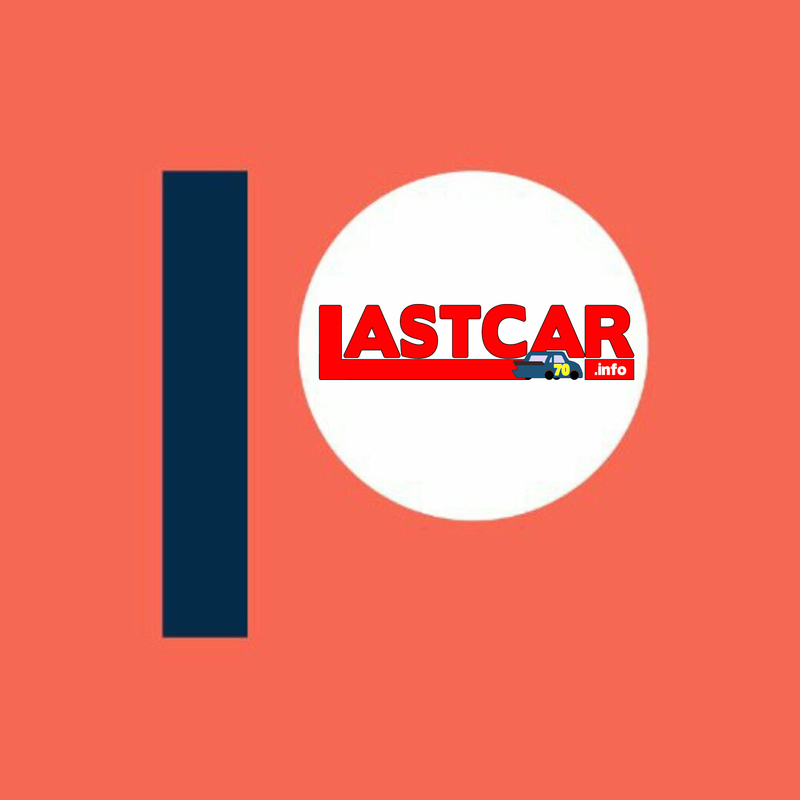 Nemechek and NEMCO Motorsports have both regained the lead in the LASTCAR driver and team rankings. *This was the first time Joe Nemechek has ever finished last in a Cup race at Pocono. *The #87 had never before finished last in a Cup race at Pocono. *The last time a driver finished last at Pocono with transmission problems was Bob Schacht, who also started 30th and fell out after 11 laps in the 1994 Miller Genuine Draft 500. That race also marked the third and final Pocono win for Geoffrey Bodine. 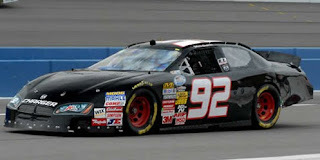 Dennis Setzer picked up the 7th last-place finish of his NASCAR Nationwide Series career in Saturday’s Federated Auto Parts 300 at the Nashville Superspeedway when his unsponsored #92 K-Automotive Motorsports Dodge fell out with handling problems after he completed 3 of the race’s 225 laps. Setzer qualified 30th at a speed of 153.971 mph, but went behind the wall during the race’s opening green-flag run. Sprint Cup last-place leader Derrike Cope followed suit after 15 laps and wound up 41st. Chase Miller, after qualifying a stellar 13th, followed D’Hont-Humphrey teammate Danny O’Quinn, Jr. behind the wall after 21 laps with Miller snagging 39th. 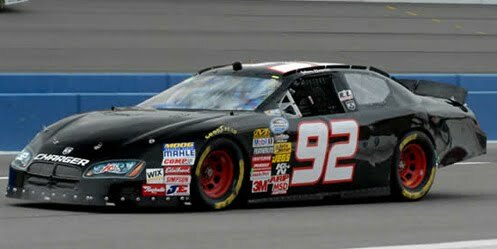 The finish was Setzer’s first in three races, dating back to the Royal Purple 200 at Darlington, and extended the LASTCAR lead both Setzer and the #92 team still hold in the 2010 standings. No other driver nor team has yet to finish last more than once this year. *This was the first last-place finish for Setzer, the #92, and K-Automotive Motorsports at Nashville. No driver had ever finished last at Nashville with handling problems, either.